Home >Ceiling Fans >Ceiling Fan Tips and Advice >How do I choose a fan size? What size ceiling fan should I choose? See diagrams below to select a fan size that will accomodate the size of your room. This will ensure maximum airflow in the room, and optimal performance. If the ceiling fan is too small for the room, it has to run at a higher speed in order to be effective. • Airflow is measured in CFMs (Cubic Feet per Minute or volume of air the ceiling fan can move). • Watts Used is the amount of electricity used by the ceiling fan. • Efficiency is measured in CFM/Watts (amount of air a ceiling fan moves in CFM divided by the amount of electricity it uses in Watts). 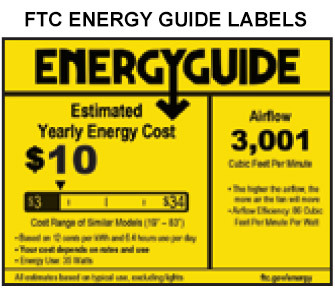 As of Fall 2018, FTC Energy Guide Labels are included on all ceiling fan packaging. 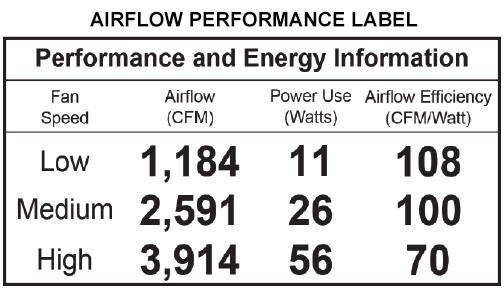 These new yellow labels offer helpful information regarding averages for airflow, wattage and energy costs. with the actual performance specifications at different speeds.